In its simplest form the sales playbook is the buyer focused "user manual" that the entire sales team should use to build relationships with past, current, and future customers. Within its pages, the sales playbook contains value propositions, buyer personas, and marketing messages. It provides the content roadmap that the sales team needs to understand when and how to use the right pieces of content to connect with prospective customers. In this vein, the sales playbook creates repeatable processes that will help sales teams understand that building relationships and increasing sales relies on sending the right content, with the right persona, during the right stage of the buyer's journey. This proven recipe for sales success will not only increase sales, but it will also deliver sales consistency and help marketing with the ever challenging ROI battle that is fought inside of every small to mid sized business. Creating a sales playbook can be a time-consuming task, which is why so many companies either A) fail to create one, or B) copy and paste from an outside source instead of spending the time needed to customize the content to the needs of their organization. Don't choose option A or B. You should choose option C) create, implement, and actually use a customized sales playbook that will benefit your entire organization. The good news is that option C is made easier with the following three steps. Step #1. Create a playbook that is concise and user-friendly. Just as no one wants to spend more than a few seconds waiting for Google to load their search results, no one on the sales team will want to dredge through an entire sales encyclopedia as they hunt for one specific section. In this vein, you should create a playbook that is user-friendly. Your sales team should be able to quickly flip through the sales playbook to find the answer to their questions. To achieve this user-friendly status keep the following tips in mind. Use language that is simple and concise. Clearly label sections with headers and a brief (three sentence or less) description that succinctly summarizes the section. Write passages for specific teams. For example, the information that regional teams requires will vary from the data presented to global teams. Use actionable headings that encourage sales associates to actually follow the advice contained within each section. Make the playbook easy to scan, read, and digest. You want your sales team to engage with the content, not dismiss it. Step #2. Create a specific objective for each section of your sales playbook. If you selected option B, then you would have skipped this step. By choosing option C, you have understood the importance of customizing your sales playbook to meet the unique needs of your organization. Your sales playbook needs to be aligned to your company's mission, values, and vision. To achieve the latter goals, keep the following tips in mind. "Increasing sales" is not a specific objective. Focus on developing a consistent and repeatable customer-centric process. Create objectives that promote a better customer experience throughout the entire buyer's journey. Map out your ideal customer lifecycle. Define tactics and processes that have led to actual sales within your organization. Remember, your sales playbook should help your team fine tune their approaches, so that they can increase sales, while simultaneously creating the foundation needed for meaningful customer relationships. Step #3. Implement, track, and adjust your sales playbook (as needed). Marketing and sales strategies are meaningless without the data needed to backup your claims. In other words, you completed the data-gathering research needed to create your sales playbook, now it is time to measure the results. To do this, keep the following tips in mind. Run an A / B test that compares the results of the sales team members who read and used the strategies included in the sales playbook vs. the sales team members who didn't bother to open its pages. Track what sections of the sales playbook are being accessed the most. 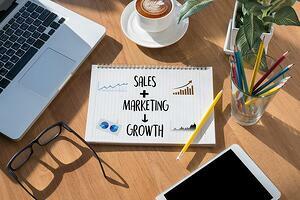 Analyze if those sections are leading to increased sales and improved customer relationships. Update your sales playbook to adjust to the ever-changing customer needs and purchasing habits. Ensure that the sales playbook is creating consistency without turning your sales team into a bunch of "human robots." In other words, you want to make sure that the sales playbook incorporates a human element. It should be a guide, not a script. The moral of the story is simple, marketing teams should help create the strategic sales playbooks needed to enhance results. This invaluable resource will become the content roadmap that the sales team needs to deliver the right content, to the right audience personas, and at the right time of the buyer's journey. Creating, implementing, and measuring the impact of your sales playbook will improve the entire sales process and inevitably become the most used and best resource for the entire sales teams.